Hi, my name is Larry, and I’m a niche site addict. What happens is this: I’ll be reading through an article or some latest news story, or watching a video on YouTube and see something that catches my eye. The next thing I know, I’m pulling up Market Samurai and doing keyword research and SEO competition analysis to see if there is a good opportunity to rank. 99% of the time, I talk myself out of it. This time I just couldn’t talk myself out it. If you read over my April Side Income Report, I already gave you a heads up about the new site, and mentioned I’d be writing about it. This is the first of what I hope to be a case study on building a niche site. The Google+ Niche Site Community I created along with Jason Hill recently started a friendly “Niche Site Duel” to help keep each other accountable, share our learnings, and to get advice. 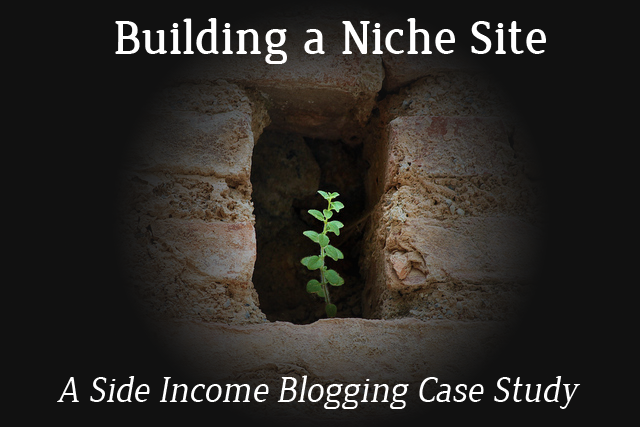 If you’ve been thinking about starting a niche site, now is the perfect time to do so. The duel is a great opportunity to build out a niche site, and get feedback and input from some real experts. Special thanks to Servando So Yong Silva, one of the community members, for the idea and for pulling it all together. I’m not going to disclose the specifics of the niche or my keywords right now. I will do so later, once I’ve made some traction on the keywords. While I would love to work in full disclosure, unfortunately there are people out there that will find out what I’m doing and try to directly compete with me. Am I passionate/interested in the topic? This is an important one for me, because I don’t yet outsource any content. I write it all myself. If I’m going to write on it, I have to be passionate about the topic. If and when I begin outsourcing content, this won’t be a big concern for me. Does Amazon carry the product, and is it popular? How is the Adsense CPC? Is it above a $1? Both of these are important questions to ask to determine if their is revenue potential. Are there one or more keywords that receive at least 3,000 searches and have low competition for the first page on Google? Does my new niche site idea meet the criteria? I found this niche idea/product one night while casually surfing Youtube for a video to share on one of the Facebook pages. I started doing a little research on it, and found the whole product niche incredibly interesting and frankly exciting and fun too. I definitely realized I had a passion for the topic. I immediately went to Amazon to see if they carried the various products and check out the price ranges. They did, and multiple products from multiple vendors too, along with a number of related accessories. Higher end versions of the product carried a pretty high price range too, always a plus. I looked to see how many reviews each product was getting as well. This is a great way to determine popularity and sales of the product. Then number of reviews was high. Good. I didn’t research Adsense CPC, as it was clear this niche idea would make for a great Amazon based review/product information site. But, for reference I use Market Samurai to research CPC while I’m doing keyword research. I did find 2 or 3 keywords that received 3, 000 or more searches, with fairly low competition. One in particular receives about 4,400 searches per month, and the monthly SEOT in Market Samurai is 1,848. SEOT is the maximum number of potential clicks that the #1 ranked webpage for a specific keyword could receive in the specified timeframe. I use monthly as it’s more meaningful to me than daily. SEOT is a good measurement of click throughs to your site, and helps you estimate potential earnings as well. Both of these values were above my minimums, and a quick look at the SEO competition tab showed that while there was a bit of competition, I felt pretty comfortable that I could compete. Basically, I saw lots of green in Market Samurai. I also spent some time digging into some long tail keywords to make sure there was plenty of ideas for articles. There were. This niche site idea met all my requirements! w00t! Time to actually build out the site and create some content! I literally spent about 4 hours trying to find a good domain name and all of the ones I wanted were taken (curse you domain squatters!). Finally I ran across one that I wasn’t 100% pleased with, but given I was struggling, I just went with it. I found a number of Partial Match Domains for my target keyword, but wanted to try a site with a brandable domain this time rather than a PMD. Sometimes it’s just better to pull the trigger and move on. The domain was a .com, so that’s a plus in my book. I then set-up hosting and installed WordPress, and began thinking about which theme I should use. Themes are important. The theme you use must be professional looking, fast, SEO optimized and fit the presentation style of your site. One consideration that often gets overlooked is what I’ll call, “presentation style”. Presentation style is all about how your content will be presented to the end user. Will your niche site use a traditional blog model (latest posts in date order on front page), will it be more like an online Magazine (posts organized by category), or will it look more like an online store. A new one, which I haven’t tried yet is a Pinterest type layout. Sometimes this decision is difficult to make early on in the process. If you aren’t sure, just go with the traditional blog style. You can always change it later, that’s the great thing about WordPress. For this niche site, I knew I would be writing about news updates, information/tips articles, and reviews. So I decided on a magazine style layout. There are many magazine style themes, and the one I initially started with was the Magazine Pro Genesis child theme. Genesis is flexible, up to date, and fast. Any of the Genesis child themes are always good options. Later that evening, I was looking at a friends niche site, and really liked the theme he was using. Turns out the them is called Jarida and not only did it look amazing, it had tons of layout options, widgets and features, including a review format that showed review stars. The theme is also HTML5. That was enough for me, I bought it. So far, I’m very pleased with it, especially given the cost. Next I designed a quick logo using some photo stock and fonts I found on dafont.com, did a little customization to Jarida to make the theme colors match my logo, and began writing the first piece of content targeting my primary search keyword. This article will be on the first page of the site for now. I’ll most likely move it once I get more content on the site, but we’ll see. Contains a product table up high that highlights the top product choices, and includes links to Amazon. I used EasyAzon to do this – really awesome little plugin. Provides mini reviews of the top products, that I’ll later link out to full reviews. The article is SEO optimized for my target keywords. While working on the site, and writing the first article, I had Google indexing turned off. I went ahead and enabled it this morning, and will register the site with Analytics and Webmaster tools today. That should start the indexing process. I also set-up ProRankTracker to monitor my target keywords so I can see when I start to rank, and monitor my progress both for myself and so I can report on my progress for you. What’s next for my new niche site? News alerts on the topic I get from Google Alerts based on a few keywords I set-up this morning. I’ll also monitor incoming search traffic in Webmaster tools for article ideas as well. That’s all for this week. Don’t forget, if you’ve been thinking about starting a niche site, now is the time. Join us in our friendly “Niche Site Duel“. This is going to be fun! Interesting to see what you come up with, I should be posting my first authority site post today 🙂 These help to get thing done. Hey Miki, will be interesting for me too. Sometimes my efforts do great, other times they fail. Just hope this case study isn’t the fail ;-). Posting about your efforts definitely helps you get things and done and encourages you to be successful. Thanks for stopping by.